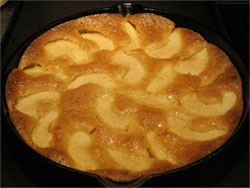 I have made this Swedish Apple Cake for two dinner parties now, and it's been a big success. NOTE: I do not use fiji, but granny smith instead. The cake is already very sweet, so the granny smith adds a necessary tartness.